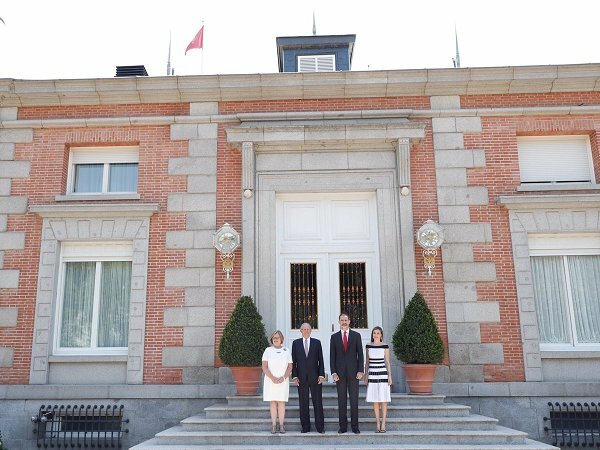 King Felipe and Queen Letizia of Spain held a official lunch at Zarzuela Palace for President of Peru, Pedro Pablo Kuczynski and wife Nancy Lange on June 13, 2017 in Madrid, Spain. 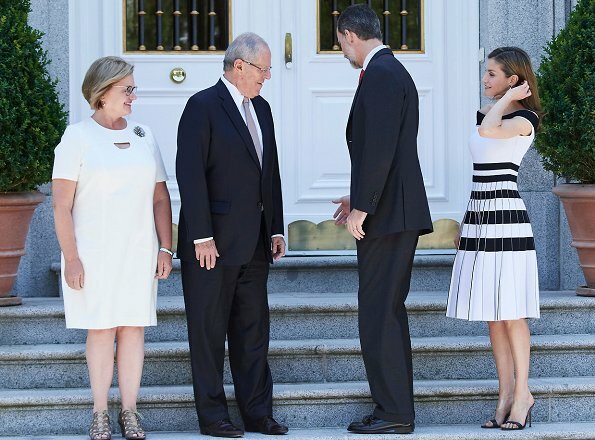 President Kuczynski is on an official visit to Spain. Aww, Peruvian hand-holding. Picture is so sweet! Pleats seem to be the 'thing' for this summer, don't they? They're kind of fun as they tease the eye and you wait for what is hidden. I like Queen Letizia's version much better than the one on the model whose shoes make it all look dowdy. Même décolleté que Mélania,que Victoria.La mode est lancée !!! I did not have time to visit this site for a while. What has happened to Letizias face? It looks different. Maybe it's only age, some fine lines around the eyes, which is totally fine. Some signs of tiredness? But something doesn't work for me, is it the eye make up? the eye brows, the too long hair? I don't know yet. I love the perfect fitting dress with the block stripes and the pleads. Not so much the off shoulder neckline. Would have looked much better with a wide V-line. But I must admit I totally dislike the Carolina Herrera sandals with the transparent middle part, looks cheap to me, like some fancy bath sandals with heels. No! And also a big No! to the shoes on the model. By the way, the shoes of the First Lady of Peru are also an unfortunate mistake. I like the dress as it is very much! But both photos of the shoes (Letizia's and! C. Herrera's proposition on the model) are really not the world. - No comment about their guest, Mr. Kuczynski, because we are on a Fashion-blog:). 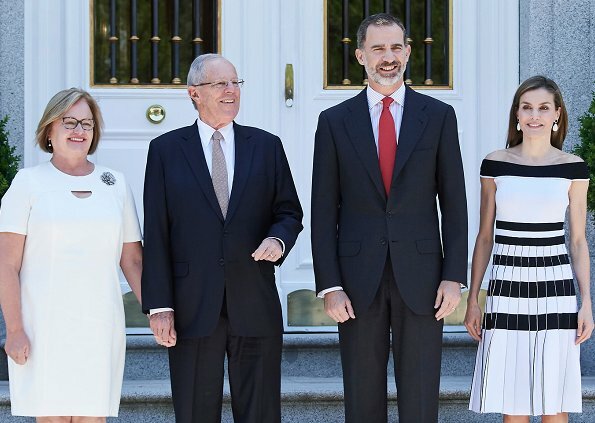 Its a lovely dress and suits Letizia's figure wonderfully. BTW: is Carolina Herrera her new favorite brand? I have a feeling she's been wearing this brand quite often lately. But Letizia's shoes were not good choice for an official event. Okay, they were nice change for those pumps we see too often but somehow these heels look tacky! I liked her hair styled like this. Off the face but loose. Very beautiful. I find this dress exquisite, I can see it with a wide brim hat, drinking champagne on a yatch 😄😄😄I am glad that she had it altered because the midi length somehow will swallow her figure, although in doing so they ended up cutting one of the stripes at the waist, also the higher back and neck line seems more appropriate for the 3 events that she had this morning. I also like the sandals quite a bit. Love the earrings, hate the shoes and I think the dress while pretty is too informal, although lovely.